It is a way to your blood stream lying just below your skin in the arm or the leg allowing blood to be removed and returned quickly, efficiently and safely during dialysis. This is the most effective treatment for renal failure. The dialysis machine is an artificial kidney for removing impurities from your blood and return it quickly, safely and efficiently to your blood stream. It thus regulates fluid and chemical balances. 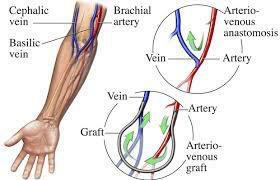 In both the cases blood flows from the artery to the vein, dilating it and also strenthning it. 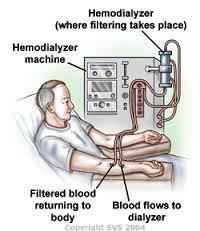 By this procedure a large amount of blood passes through the vein rapidly which helps dialysis to proceed efficiently. The fistula takes about 8 – 12 weeks to mature. At maturity a large dialysis needle can be placed within the vein without injuring it.